You can look at the photographs. Please do. But it won’t work. Neither words not pictures can really do justice to Koyasan – it truly is one of the most atmospheric places we’ve ever been to. The first monastery was founded on top of Mount Koya 1200 years ago. There are now over 100 Buddhist monasteries dotted about the top of the Mountain, and about half of them accept guests. 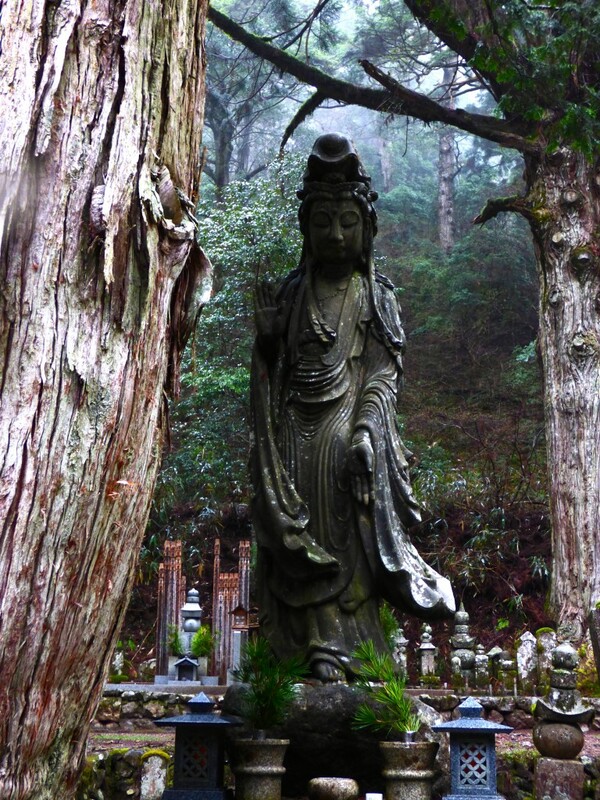 Buddhist monasteries have a long tradition of hospitality to travellers but over recent years the monasteries on Mount Koya have turned that into a business albeit one with foundations firmly grounded in their traditions. Given the depth of history it’s not surprising that the monasteries are beautiful, with carefully manicured trees and gardens all around. Internally they are made of traditional materials, wood, rice paper and so on: Which makes for lovely, if, horribly poorly insulated, accommodation. The monk who founded the first monastery is buried at the far end of the village. 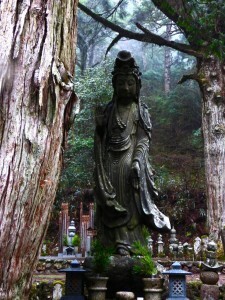 Over the years the great, the good and everyone else has tried to be buried near him creating an enormous rambling graveyard filled with carved stones standing under towering Japanese Cedar trees. The trees are up to 600 years old and some stand over 50m tall. The grave stones and figures of buddha are all highlighted in deep green moss. When we visited this afternoon a low mist hung over the whole mountaintop adding significantly to the atmosphere. 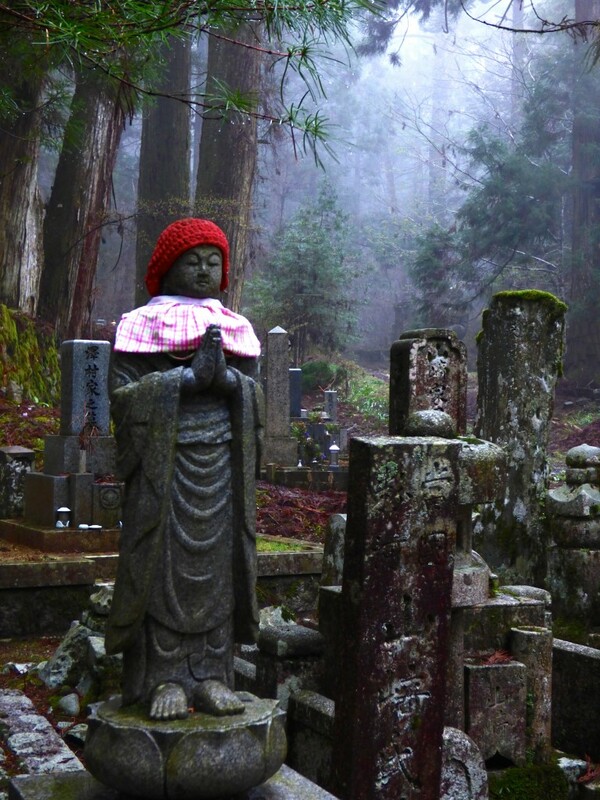 The stones, the moss, the trees and the mist – and amongst them splashes of red where cloth jackets have been draped over some of the statues. The whole place is silent, still, and under the vaulting arches of the trees encourages whispers in the same way a cathedral does. We were all completely overawed by the graveyard. It definitely sits in the top few experiences we’ve had anywhere in the world. I would recomend a visit here for anyone’s bucket list. 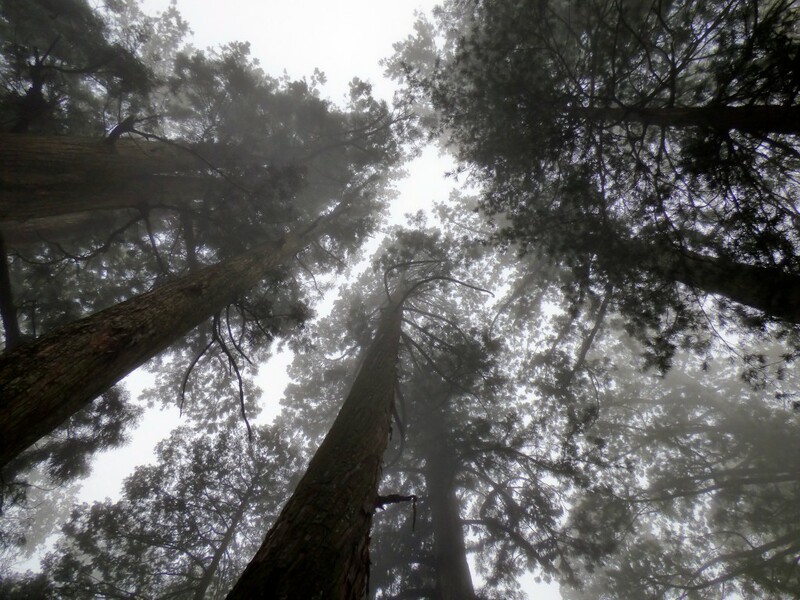 Towering 600-year-old cedars in the Okunoin graveyard Koyosan. We’re staying in the Ekoin Monastery. We have two lovely tatami-mat rooms with golden rice-paper sliding walls. We were greeted on arrival by a monk who, with the best English we’ve heard anywhere in Japan, guided us to our room and explained how the Monastery works. Dinner at 5:30 sharp and while we eat the novices set out our bedding. Then tomorrow morning we are welcome to join the morning prayer ceremony and the fire dedication ceremony. Dinner was vegan and very tasty – it was actually something of a relief to know that anything we were eating but unable to identify was a vegetable rather than an animal part. After dinner we rugged-up and went back to visit the graveyard in the dark. Small lanterns light the path between the graves with a soft yellow glow, but otherwise the place is pitch black. Strangely it didn’t feel threatening or scary, just atmospheric in the way an ancient building can be. By the time we returned it was getting pretty cold, which made a visit to the communal baths very welcome. The water here comes from local springs and is supposed to be good for your skin. I can’t speak for its healing properties but I can confirm that after a walk in a cold graveyard a boiling hot bath is just the thing. Okunoin graveyard Koyosan in the mist. Torii in the Okunoin graveyard Koyosan. Night in the Koyasan graveyard.